Not happy with my color choices on this one, but whatevs. 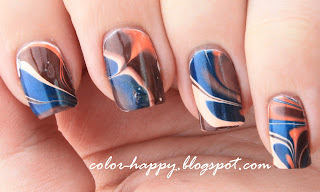 This is only my second water marble ever, so it's not bad, considering. This is Sally Hansen Forbidden Fudge, Sally Hansen Insta-Dri Teal-y Fast, Essie A-Crewed Interest (what's with all the puns in nail polish names?) and e.l.f. Coral Dream.